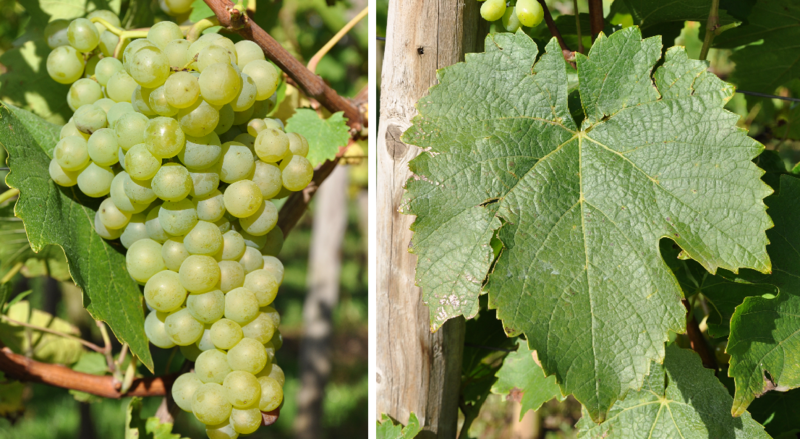 The white grape comes from Germany, Synonyms or color game types include Orléans, Gros Riesling, Grüner Orléans, Hartheunisch, Harthengst, Orleaner, Orléans Jaune, Orléanstraube, Orleanzer, Orlänzsch, Weißer Wälscher and Weißer Orléans. The attribute "hard" refers to the thick-skinned skins of the productive vine. It produces alcoholic and full-bodied acidic white wines with diverse aromas of dried apricot, herbs, hay and beeswax. According to DNA analysis There is no (previously suspected) connection to the variety Heunisch ( Gouais blanc ), although some synonyms seem to indicate this. After Lambert von Babo (1790-1862) she is to be at the behest of Emperor Charlemagne (742-814) imported from Orléans and on Rüdesheim mountain been planted, which was later also called "mountain Orléans". There is no evidence for that. In the area of Orléans were never mentioned varieties of this name. The variety is among the earliest proven Frankish Sorts. A first mention was made by the German botanist Hieronymus buck (1498-1554) in 1539 in his famous "Kreutzer book" under the name Harthinsch. It used to be widely used in Germany and was often used in the mixed sentence together with other varieties like Elbling, White Heunisch ( Gouais blanc ) Riesling, Ruländer ( Pinot gris ) Sylvaner and Traminer grown. The vine was very popular due to the yield wealth. Friedrich Bassermann-Jordan (1872-1959) writes in his well-known book "History of viticulture", that then the Riesling originally on Rhine native varieties Trollinger ( Schiava Grossa ) and displaced Orléans. According to the "wine book" of agronomist Dr. Wilhelm Hamm (1820-1880) from 1865 was Orleans until the mid-19th century in many prominent locations in the palatinate planted. The Forster individual layers Jesuitengarten. Kirchenstück and Enormous were planted with a mixed set of Orleans, Traminer and Riesling. The legendary 1811ercomet vintages So it was probably not a sort Riesling. On Castle Johannisberg 1857 Orleans wines still came to auction, The last known Orleans wine was pressed in 1921 in Rüdesheim. Then the last vineyards were cleared and the variety was long considered extinct. It was not until the 1980s that Helmut succeeded Becker (1927-1989) in Geisenheim from wild sticks on the Rüdesheim mountain to breed the variety again. At the beginning of the 1990s experimental plantations were carried out in Laumersheim (Pfalz), using as a basis seven old vines from the Cistercian monastery Eberbach were used. The Rüdesheim winemaker Bernhard Breuer put on a small vineyard with 500 sticks in 1995 and 1996. The virgin wine came in 2002 on the market and was a wine-historical rarity. Likewise, a wine from the winery clippers generated. In November 2008, the biologist Andreas Young in the single location monastery Disibodenberg of the winery Racknitz five feral old sticks of the Orléans found that are believed to be over 500 years old and hence to the oldest vines count worldwide. In 2010, no inventory was recorded. This page was last modified at 3 March 2019 at 13:07.